If you're a digital illustrator, graphics designer or 3D artist, you’ll probably use a graphics tablet (also known as a drawing tablet) already. Whether you prefer Windows or Mac OS, connecting a graphics tablet to your desktop or laptop computer is usually the easiest way to start a digital illustration or design under tight deadlines – but still feel like you're drawing on paper – using Adobe Creative Cloud, Autodesk SketchBook, Autodesk Maya and other software. Here we’ve created a list of the best choices for you. 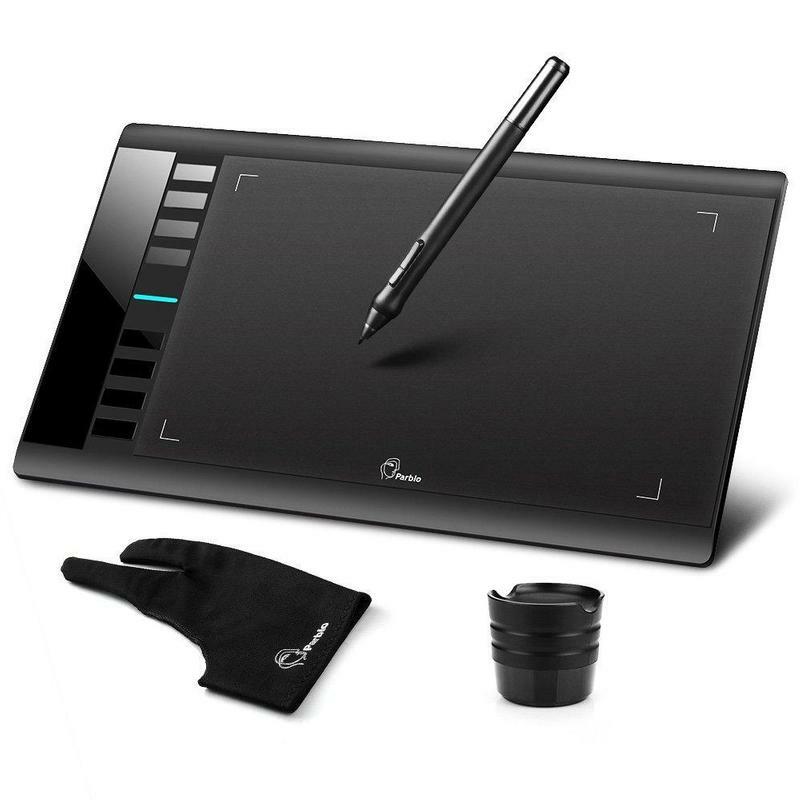 The most popular tablet brand for artists and designers is usually Wacom – specifically its Intuos Pro graphics tablet. But there are less expensive alternatives, which we also feature in this list. To make sure you’re looking to buy the right device, a graphics tablet is an input device consisting of a flat, pressure-sensitive pad which the user draws on or points at with a special stylus, to guide a pointer displayed on the screen. You’ll need to ensure the tablet is set up with your preferred editing software, using the included Driver CD and user manual. Usually, it involves visiting the specific software website to download and install the latest drivers. This should only take a minute or two. If you use Adobe Photoshop, see photographer Tigz Rice’s tutorial on how to set up a Wacom tablet for Photoshop. The less expensive tablets on this list come with an an anti-fouling glove – although these can help with friction when drawing on a tablet, they’re not essential to use. All graphics tablets in this list come with a stylus, USB and rechargeable wire (if separate), CD driver and a handy user manual. 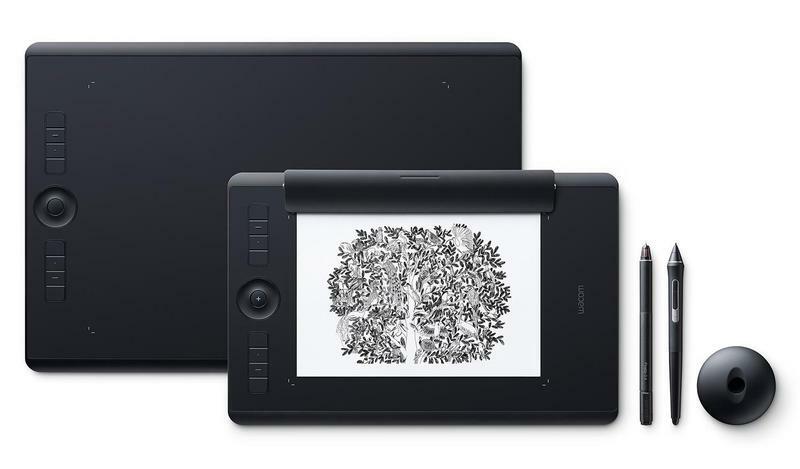 If you'd prefer to draw digitally directly on screen, see our list of the best tablets for art and design (including the iPad, Android tablets, tablet PCs and 2-in-1 laptops) and our guide to the best cheap Wacom Cintiq alternatives. The Wacom Intuos Pro is both the best drawing tablet - and the most expensive. But for your money you get the best drawing experience and widest software support. There are two main models, Medium and Large. The Medium has a 13.2-inch drawing area (similar to A5 in size) and the Large a 16.8-inch area (approx A4), so both options offer a larger drawing space than any other rival tablet in this list. Each tablet has customisable keys and a touch ring for shortcuts, and you can purchase additional texture sheets depending on what you prefer artistically. There's also a Small version, though this a previous-generation project that's still available (for less than £200/$200). 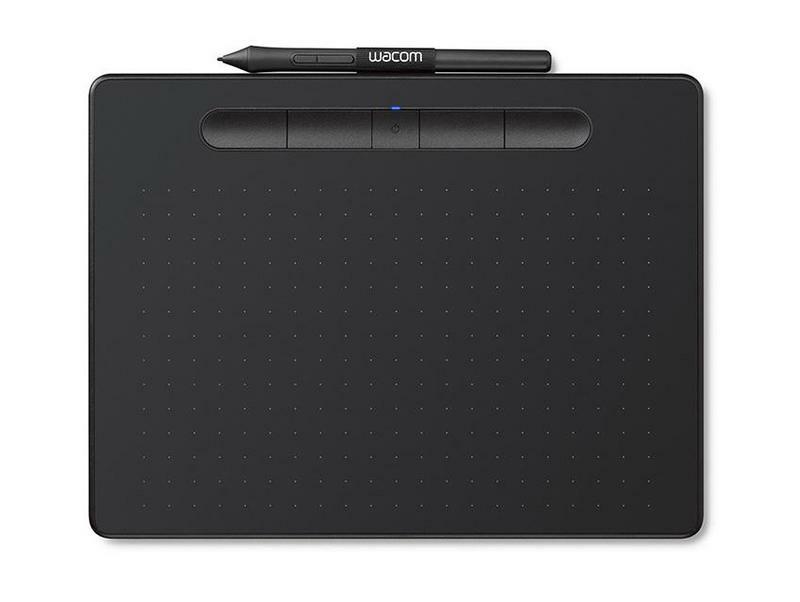 The Wacom Pro Pen 2 has 8,192 levels of pressure sensitivity, higher than any of its rivals. The Pen boasts natural tilt support, virtually no lag and doesn’t need batteries. 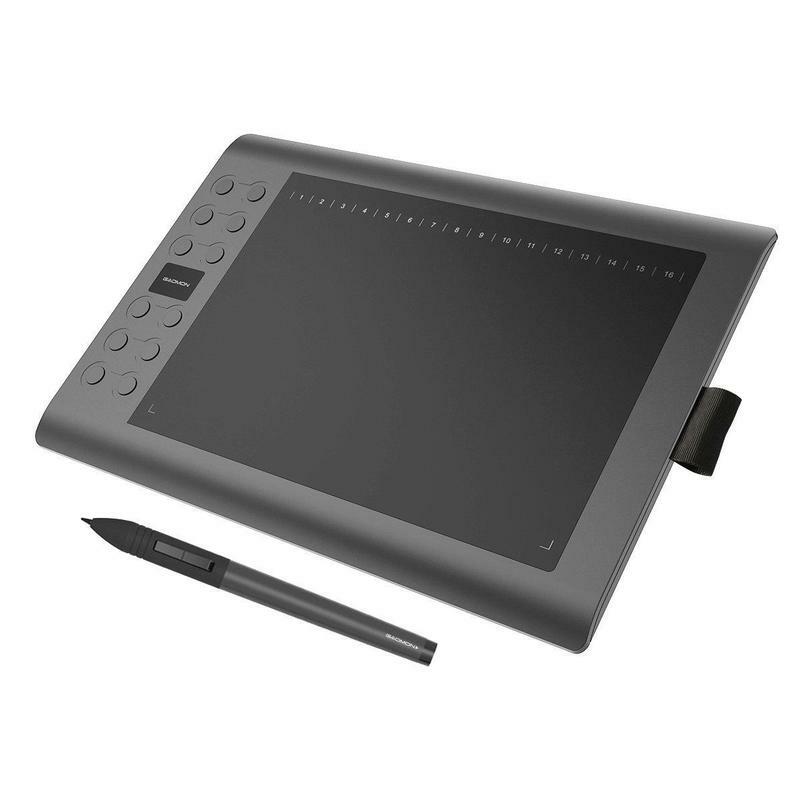 If you're a 3D artist you may be interested in using the Wacom Pro Pen 3D (sold separately), which has extra buttons to pan, zoom, model, sculpt or modify. Each pen comes with a handy stand as well which can store spare nibs. With built-in Bluetooth or USB you can connect the tablet to any Windows or Mac device. If you still prefer to draw on paper first, and want a speedier process than scanning individual sheets of paper into Photoshop, then a Wacom Intuos Pro Paper Edition may be your best option. Again available in Medium or Large versions, the Paper Edition lets you draw on paper on top of the tablet, with the results saved to your computer as image or vector files. Previously known as the Bamboo range, Wacom's (non-Pro) Intuos is a great choice for those on a modest budget. Again there are two sizes, Small and Medium - with the A6-ish Small version available with Bluetooth for wireless use, or without (the Medium version has Bluetooth as standard). The key differences between the Intuos and Intuos Pro is that the less expensive tablets have lower pressure sensitivity - 4,096 vs 8,192 - and, more importantly, don't support pen tilt. So you can't affect the shape of brush strokes by tilting the pen - which might not be a problem for graphic designers doing page layouts. Lastly, there's no eraser on the end of the pen. A much more affordable alternative to the Wacom Intuos Pro is the Ugee M708 graphics tablet for Windows and Mac OS. This tablet has a 10x6-inch screen, eight different customisable keys and a pen offering 2,048 levels of pressure sensitivity. The tablet works with Adobe Creative Cloud software, Comic Studio, 3D Max, Pixologic ZBrush and Autodesk Maya. The keys can be used to erase, zoom in and out, scroll and undo for your convenience. It’s user friendly for right or left handers and comes with a pen holder and extra pen tips – making it a good fit for any artist or designer. 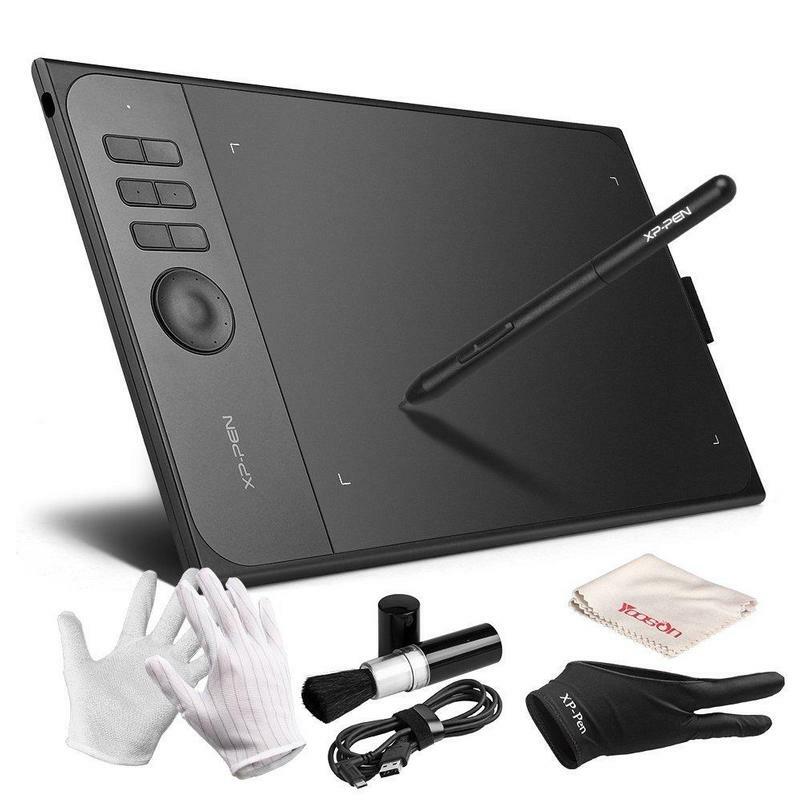 Purchasing the Ugee M708 from Amazon, you’ll also receive a pen holder including eight pen nibs and a pen clipper, an anti-fouling glove to reduce friction while drawing on the tablet (although it's not essential to use) and a pair of white gloves for those overly concerned with germs. Similar to the Ugee M708, this 10x6-inch graphics tablet is sold with a rechargeable pen offers with support for both Windows and Mac. The pen offers 2,048 pressure sensitivity, and a maximum use time of 350 hours after every three hours charging. 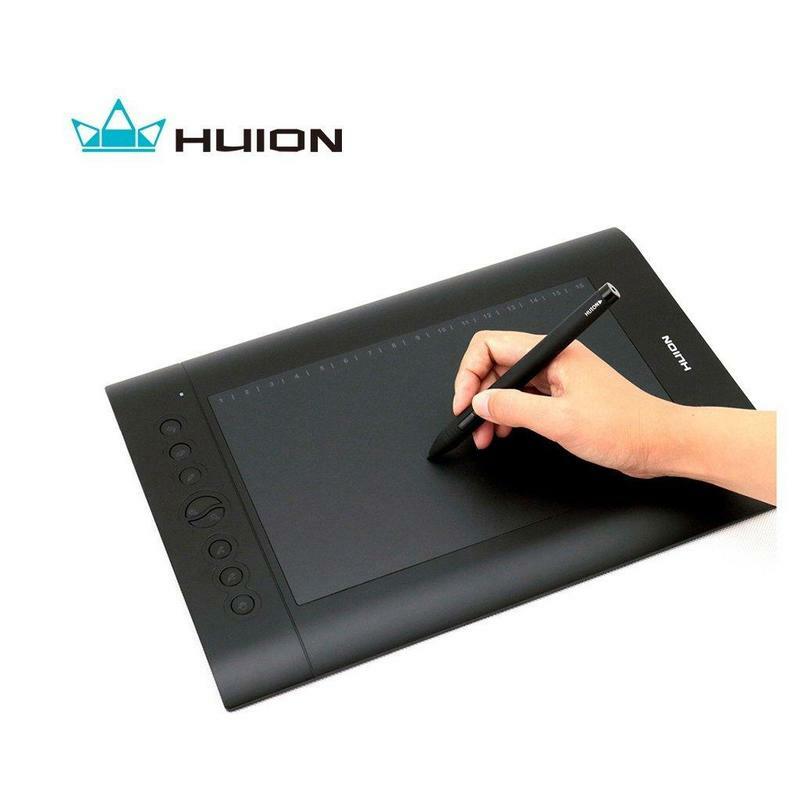 Drawing software such as Autodesk Sketchbook, Manga Studio and ZBrush is compatible with the Huion H610 Pro. With the tablet you’ll get a pen holder with four extra pen tips and one pen tip remove tool. The tablet also has built-in customisable keys on the left-hand side, so left handers might find this difficult. The Gaomon M106K follows suit with a 10x6-inch screen size and a rechargeable pen with 2,048 levels of pressure sensitivity. This tablet has ample buttons, with 12 express keys on the left and 16 on the top of the tablet, available to be customised as you wish. It also comes with a nifty pen jacket on the side so you’re less likely to lose the pen. The pen also comes with four extra pen tips. The Gaomon M106K works with Windows and Mac devices and with software including SketchBook Pro, Manga Studio, Corel Painter and Adobe Creative Cloud. The XP-Pen StarO6C matches Wacom's pressure sensitivity levels in its battery-free pen technology compared with the Huion, Gaomon and U-Gee – at 8,192 levels rather than 2,048. On the left-hand side of the 10x6-inch screen, the tablet has six shortcut keys and a dial with fully customisable features. It’s both compatible with Windows 10 and Mac OS 10.6 or above. On this tablet, the driver programme works with creative software such as Adobe Creative Cloud, Comic Studio and more. 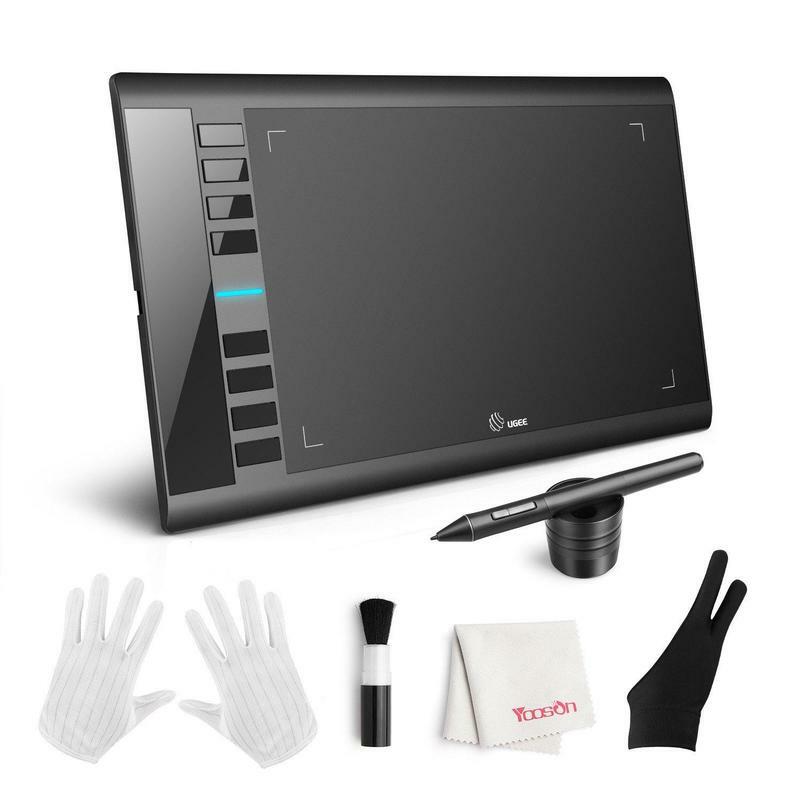 Purchasing the XP–Pen Star06C from Amazon, you’ll also receive a pen holder (Including eight pen nibs and pen clipper), an anti-fouling glove (to reduce friction while drawing on the tablet, although not essential to use) and a pair of white gloves. If you’re on a really tight budget, then Parblo is your cheapest option on this list. As well as offering its own PC tablet to rival that on the Wacom Cintiq and Apple iPad, it has this graphics tablet for under £50. The Parblo A610 again has a 10x6-inch screen size and pen technology of 2,048 levels of pressure sensitivity, but it also offers 5080 LPI resolution to show richer colours and 230 RPS similar to a thin paper, bringing you a smooth drawing experience. The tablet comes with eight stylus tip replacements, an anti-fouling glove, and a three button mouse which commands eight shortcut keys. Purchasing the Parblo A610 from Amazon, you’ll also receive a pen holder (including eight pen nibs and pen clipper), an anti-fouling glove (to reduce friction while drawing on the tablet, although not essential to use) and a cleaning kit.